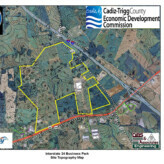 Here, you'll find maps and diagrams giving a good overall perspective of the Cadiz-Trigg County Region in relation to the neighboring communities, counties, states as well as a broader view of where the region sits among the rest of the United States. 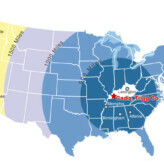 The Cadiz-Trigg region is quite the perfect location with more than two-thirds of America's population within a day's drive. 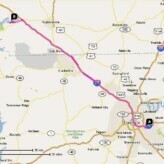 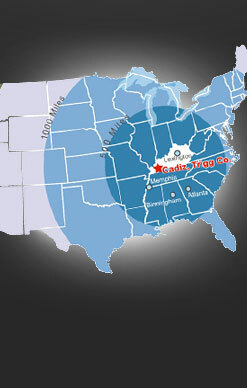 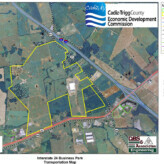 The Cadiz-Trigg County Vicinity in Western Kentucky. 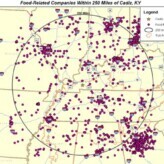 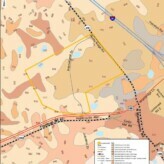 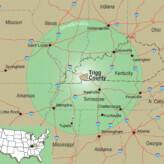 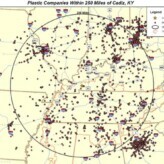 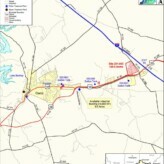 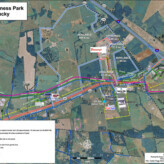 View the map of the area - a green circle represents a 250 mile radius with Cadiz-Trigg County at the center. 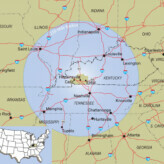 Cities within the vicinity include Nashville, Memphis, Chattanooga, Saint Louis, Lexington, Louisville, Indianapolis among others.